The settling of a couple major and long lived questions involving the Great Pyramid of Giza in Egypt are only a tiny fraction of what remains to be answered in the latest robotic foray into the tomb of one of the greatest pharaohs Egypt has ever known. The Pharaoh Khufu is buried in the Great Pyramid along with the King’s Chief Wife and Queen Meritates. A robot named Djedi, after the magician with whom Khufu consulted before the building of the great Pyramid, has brought back spectacular images of the interior of what was at one time a charter member of the Seven Wonders of the World. 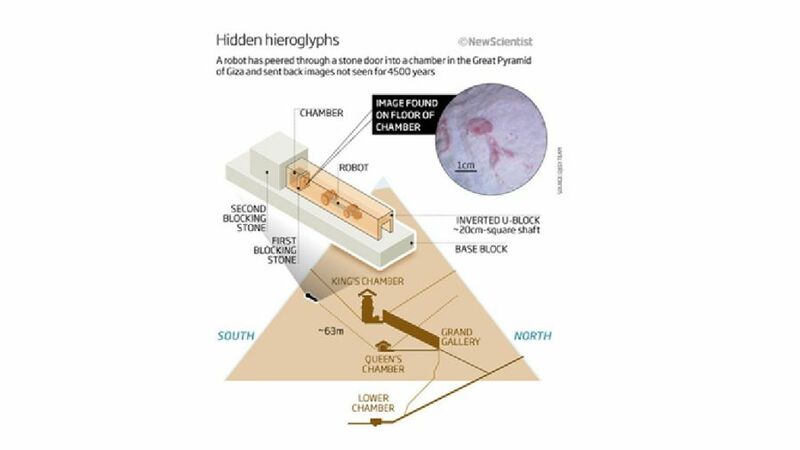 It’s a toss up for the ages whether or not the newly discovered images from a tiny chamber in the Great Pyramid of Giza in Egypt are that of religious significance or ancient graffiti tags left by an overzealous worker. What is not up for debate is the relevance of such a find in the annals of early man. The first images being sent back from Djedi have not been seen for 4,500 years and have opened up more theories on the exact nature of the grandest pyramid ever created. The recent images from inside the tomb have answered a debate on the notion concerning alien involvement from the heavenly bodies. In 1993, a similar but less advanced robot crawled 63 metres up the tunnel in the southern wall and discovered what appeared to be a small stone door. What was exciting about these particular doors was that they were set with metal pins. Metal is not a known part of the Great Pyramid and the discovery ignited speculation that the pins were door handles, keys, or even some out of this world parts of a power supply constructed by extraterrestrials. The Great Pyramid is thought to have been built as a tomb for the pharaoh Khufu, and is the last structure standing of the seven wonders of the ancient world. The Great Pyramid contains three main chambers: the King’s Chamber, the Queen’s Chamber, and the Grand Gallery. The pyramid in itself is of modern and technological significance. The ability for the ancient Egyptians to construct such a magnificent and structurally sound structure with the tools that were available in that time is simply astonishing. The metal pins that are an exciting ongoing storyline of the King’s Chambers and the Great Pyramid are now believed to be of human origination as the newest photographs have captured ornate rounded ends. The mystery continues with more images being sent up daily by Djedi the robot. More information on the Djedi Great Pyramid Project can be found on the New Scientist website.